Pavel Dmitrichenko, the Bolshoi dancer imprisoned on suspicion of instigating the acid attack against artistic director Sergei Filin, said he denied planning the assault during an audience in Moscow yesterday. He told the court that he’d told his ‘accomplice’ Yury Zarutsky, to hit Filin, but nothing more. I did not imagine that this person [Zarutsky] was capable of such a cruel and inhuman crime. the RAPSI legal news agency reported Dmitrichenko as saying. I am happy that Filin is returning to work at the Bolshoi Theatre. The main thing is that he now recovers after the inconceivable crime committed by Zarutsky, with whom I am unfortunately acquainted. I didn’t intend to damage his health. I wanted to humiliate him. It was not sulphuric acid but battery fluid, and I added some urine. Filin is still in Germany, undergoing treatment to recover his eyesight, but has said that he hopes to return to Moscow to resume work when the Bolshoi’s season starts in September. 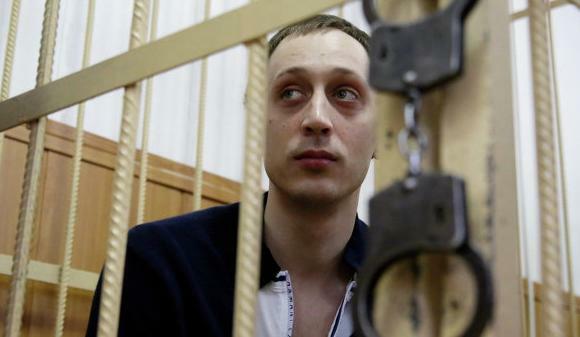 RIA Novosti reported that the Moscow court extended Dmitrichenko’s pre-trial detention until October 18.